So, right before Christmas our camera died. Jason and I were not happy. We looked into camera repair shops, but they were ridiculously expensive. We didn't want to spend the money (read, we didn't have the money) to get a new one, so we just kind of dealt with it. Which meant no new pictures of my ever growing baby belly. No pictures of our wonderful Christmas Day with just the two of us and our furries. No pictures of our own from our Texas baby shower. Then, luck/fate/whatever you want to call it intervened. Jason was going through some boxes in the garage and found our receipt from when we bought the camera! AND, there were some beautiful, wonderful, extraordinary, golden words near the bottom of it! Could it be? We had spend 25 bucks on a warranty! And it was still good! But, the catch? We bought the camera from the now defunct Circuit City. So, I made a few phone calls and found out that our warranty was still good, even if CC had gone down the tubes. They sent us a box to ship the camera off in. I packaged it up nice and tight with lots and LOTS of bubble wrap and sent it on its way. Now, I must say I am rather impressed with this company. They had our camera back to us 8 days after I sent it to them. I found it on our doorstep when I arrived home from work yesterday. Our lovely camera. It works! I took pictures. Yay! I am so happy! Now we can use both our camera and video camera to take pictures when the baby arrives. That was our biggest fear, not being able to photograph our little one right after that big, screaming, red faced arrival into the world! That was the best 25 bucks ever spent. Get the warranty people, it's worth it! 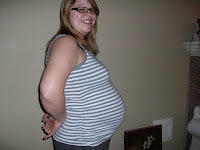 I will now leave you with a picture of baby belly at almost 38 weeks. I'm off to clean up a little more, head to the grocery store and prepare dinner for some friends this evening. It should be a great night! I'm so happy to hear about your camera! Definitely not an expense you want at this point. You look fantastic and I can't believe YOU are so close! TO answer your question, I am taking 10 weeks of maternity leave and then will return to my full time job. My hubby has a flexible schedule so he'll be home with her two days a week and then we'll have a friend watch her part time the other three. Not your typical full time child care schedule! Hey, are you on Facebook? Look me up!